had trouble falling asleep only you didn’t know what natural options would help? Instead, you kept thinking about dosing yourself with Benedryl or NyQuil, but thankfully, you thought better of it and simply toughed it out, despite how miserable it made you. needed a mid-day energy boost but thought twice about drinking ANOTHER cup of coffee? I mean, that’s rough on your adrenal glands, right? wanted to do a gentle herbal detox with your child but had no clue where to even begin? Aren’t most detoxes geared towards adults anyway? You certainly don’t want to harm your child! wanted to increase the vitamins and minerals in your diet but you’re already spending a fortune on healthy food? Bye, buy, whole-food multi-vitamins. I can’t afford you! wished you could support your immune system naturally during the winter months as a way to cut down on how often you were sick? Where are those echinacea capsules again? IF YOU ANSWERED YES TO MOST (OR ALL) OF THE ABOVE, YOU ARE IN THE RIGHT PLACE, AND I HAVE JUST THE THING TO HELP YOU. 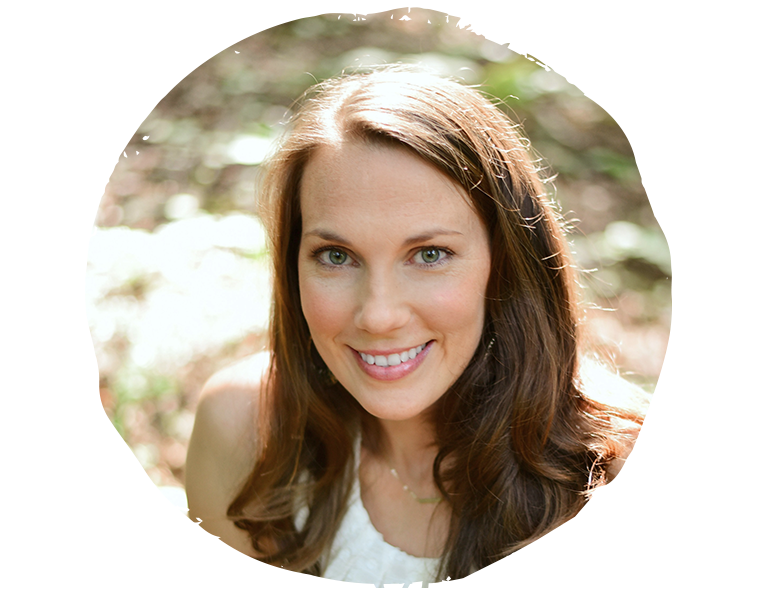 I know what it’s like to want to use natural remedies to help your baby sleep better, to give you energy, or to support your immune system during the long, cold winter months. I also know the frustrating feeling of not knowing where to begin. You wanna use the herbs because they’re natural and healthy, but you have no idea what herbs you need to combine to get the results you’re looking for. You need something that will fit your life, isn’t too time-consuming, and will work when you need it to. That’s why I’ve decided to create this mini-course, How To Create Your Own Herbal Tea Blends Using A Tea Blending Triangle, to teach you how to choose herbs using a time-tested herbal formulation tool so you can feel more confident using and formulating your own herbal blends in order to get the results you want! How To Create Your Own Herbal Tea Blends Using A Tea Blending Triangle is a mini-course designed to teach you how to create your own medicinal herbal tea blends using a tea blending triangle. There’s more to creating an effective herbal blend than tossing a bunch of herbs together, you know! One of the easiest herbal preparations to begin using is herbal teas. You can start out by making single herb teas, but eventually, you’re going to want to learn how to formulate herbal tea blends to meet your needs. But which herbs do you combine together? Do you just throw a bunch of herbs together that all do the same thing or is there a formula to creating blends? 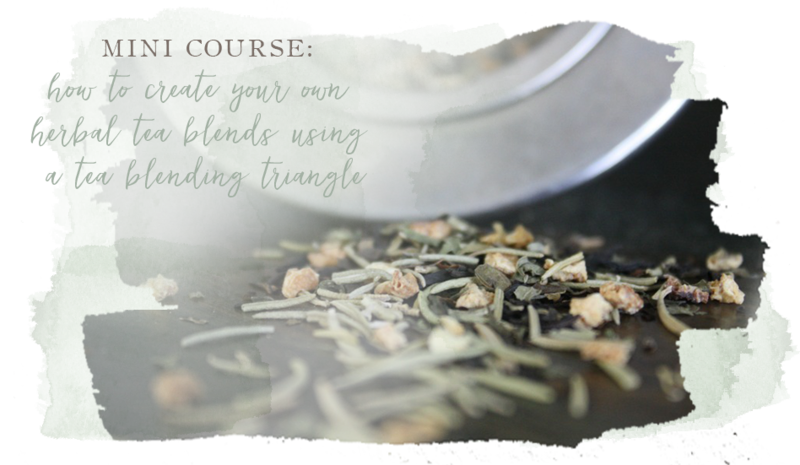 I’m here to share what I’ve learned about formulating herbs to create medicinal tea blends using a tool called a “tea blending triangle.” This blending formula is simple and easy to follow. It’s perfect for herbalists who want to dabble in creating their own unique herbal blends. The information in this course is geared toward those who are somewhat familiar with herbs and have a basic knowledge about herbal actions and herbal energetics. Don’t worry, though! You don’t have to be an expert in these areas! If you have access to a good herbal materia medica that details each herb’s action and energetic qualities, you will be all set. This is my favorite online herbal materia medica. I use it all the time! Are you ready to feel more confident using and formulating your own herbal blends to get the results you want? 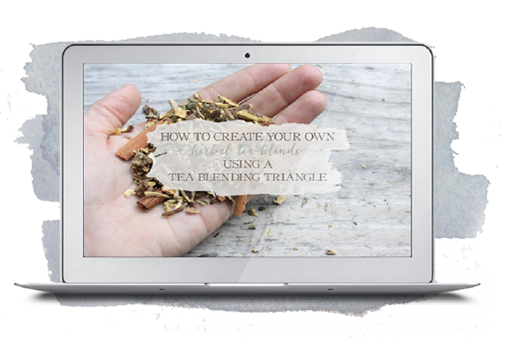 The How To Create Your Own Herbal Tea Blends Using A Tea Blending Triangle mini-course is delivered in PDF format where you can access the 33-minute video presentation via Vimeo that is downloadable if you wish. This PDF also comes with a written transcript of the course and a printable “notes” page where you can keep track of what you’ve learned in the course. Okay. I get it. You’re just not sure if this course is right for you. Maybe you have one of the following concerns. 1. Can’t I Get This Information For Free Online? Sure, you can go out and look this information up on your own IF you want to spend days or weeks gathering all your information, reading through it, trying to understand it, and breaking it down into manageable steps to follow, but I wouldn’t recommend it… unless you have lots of time on your hand or you’re absolutely broke. You see, I have a good bit of experience using this particular blending formula, and I’ve created many herbal formulas for teas, salves, and tinctures with it. Formulas that are suited to me and work. In this course, I gather all the information for you, break it down into some easy-to-understand sections, and present it to you in a very casual manner along with examples… all while explaining the what, whys, and hows behind it too. The video presentation is 33-minutes long. It’s a mini-course. It focuses on one thing. It will not take up too much of your time or overwhelm you with information, and you will not have homework (although I recommend taking what you learn and putting it to use) to turn in. No problem. You can download this video to your phone, tablet, or computer if streaming isn’t possible. I’ve also included a transcript of the video presentation which you can read instead of watching and listening to the video if you wish. Is this mini-course right for you? This mini-course is NOT for you if you’re looking for pre-made herbal tea blends that you can follow. This is for those of you who want to learn how to pick and choose the right herbs to combine in order to get the desired result you’re after. This course IS for you if you want to advance your herbal knowledge, create herbal teas or formulas that are suited to you and your needs, or you have an herbal business and want to develop your own unique line of products. Once you purchase this mini-course, it will automatically open on your computer. Be sure to immediately save the PDF to your computer so that you can access it anytime. If you have any trouble at all, feel free to email meagan(at)growingupherbal(dot)com for help. Please put “MINI-COURSE” in the subject line. Can I put this PDF on my Kindle/Nook/eReader? Absolutely. But, note that .PDF files may appear slightly different (text may be smaller) in various readers. Can I download this PDF on my iPad or iPhone? First, open up your purchase email and download the ebook onto your regular computer. Once this is done, then you can proceed to transfer it to your device(s). No. This mini-course is copyrighted. Your purchase does not entitle you to share the files or upload them anywhere online where others can access them. I’ve worked hard to create this for you, and you paid good money to have access to it, so please, make sure that you respect my copyright.